DALLAS, TX — The global reach of numismatics is on full display with Heritage Auction Galleries’ Official American Numismatic Association World Coin Auction, to be held Aug. 12-16, at the ANA in Boston, MA. The first known George V 1928 South Africa Sixpence, struck in sterling silver and graded SP63 by NGC is the Heritage ANA Boston World Coin Auction highlight. It is estimated at $200,000 to $300,000 (USD). "We’ve put together a very strong sale for our first official ANA World Coin auction," said Cristiano Bierrenbach, Vice President of International Numismatics for Heritage. "There are interesting lots from every corner of the globe but especially from Brazil, China, Great Britain, Russia and South Africa. There are also superb selections present for Spanish colonial collectors and the incredible collection of U.S. regulated world gold coins should set standards for this market." The first known George V 1928 South Africa Sixpence, struck in sterling silver and graded SP63 by NGC is not only a principal highlight of the auction, it is a landmark discovery of great interest to collectors of South African and British Commonwealth coinage. It is estimated at $200,000 to $300,000 (all prices in United States dollars). "For many years, this date was thought not to exist," said Warren Tucker, Director of Heritage World Coins. "In the 2009 edition of Hern’s Handbook covering South African coins and patterns, the listing for the 1928 sixpence says ‘None minted.’ This specimen has the last word, though." The sixpence is a recent discovery from the United Kingdom, a specimen strike made in sterling silver instead of the .800 fineness of regular South African sixpence. When the coin was certified by NGC, that service made it a highlight in its "From the Grading Room" series, a tribute to its singular nature. North American and South American history come together in the Edward Roehrs Collection of U.S. 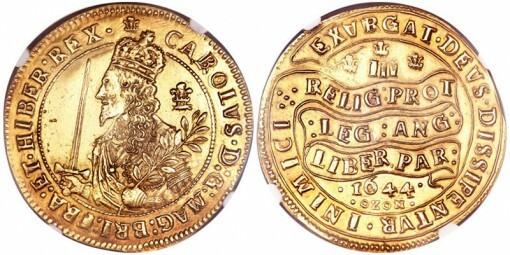 Regulated Gold, world gold coins regulated (adjusted and stamped) by goldsmiths to circulate in the infant 18th century United States. Lot 21344, a Carlos III 1775 Chile 8 Escudos or Doubloon, was regulated by New York goldsmith Ephraim Brasher. It is estimated at $75,000 to $100,000. "The phrase ‘Brasher Doubloon’ is famous among collectors of early American coins. Heritage has sold his private gold issues for multiple millions of dollars, and they appear in the Heritage Auction Hall of Fame," said Bierrenbach. "But before he made the ‘Brasher Doubloons,’ there were other doubloons regulated by Brasher, like this one." The coin itself is in VF condition, clipped by Brasher to conform to American weight standards with his famous hallmark — initials "EB" in an oval — in the center of the portrait. The Highlands Park Collection of British Coins contains many wonderful British gold rarities from the 17th, 18th and 19th centuries. Among the most spectacular is Lot 21016, a Charles I gold Triple Unite struck in 1644 at Oxford, graded XF Details by NGC with Mount Removed. Charles I gold Triple Unite 1644 Oxon. It is estimated at $40,000 to $50,000. 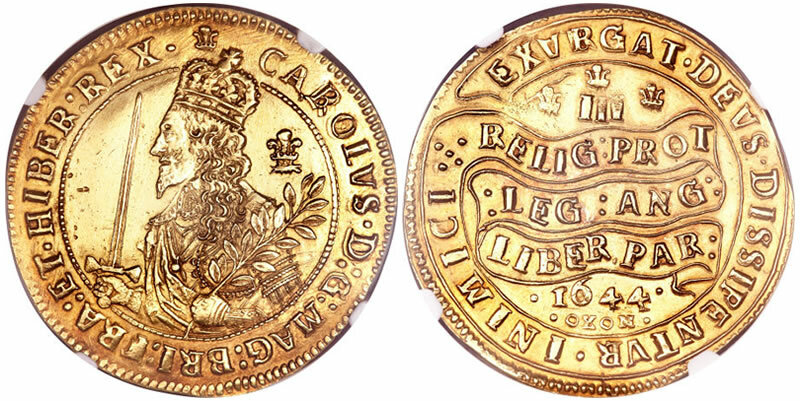 This popular large-denomination early gold coin was struck in the middle of the First of the English Civil Wars, which Charles I would lose, along with his life. In the same year this Triple Unite was struck, Oxford saw an attempted siege which was foiled by the king’s escape. A massive Nicholas II of Russia gold 25 Roubles, Lot 21822, is graded PR61 by NGC and estimated at $125,000 to $150,000. This impressive piece, which contains more than 32 grams of pure gold, was one of 301 pieces believed to have been struck as commemoratives for the coronation of Nicholas II. Few examples have survived today, and the 1896 25 Roubles is one of the classic gold rarities of 19th century Russian numismatics. Furthering the theme of "great gold" is Lot 20608, a People’s Republic of China Proof Lunar gold Kilo 10,000 Yuan made in 2006, the Year of the Dog. This Shenyang Mint coin is still housed in the original export packaging, a full 100 millimeters across with 32.146 troy ounces (one kilogram) of gold. Only 15 of these pieces were produced, and this example falls right in the middle of the run; it is lucky number eight, and is estimated at $200,000 to $225,000. Additional Featured Collections for the auction include the Don Benito Collection of Hispanic Gold, which has over 100 different 8 escudos coins; the Guilford Courthouse Collection, which offers 19th century British coins in extraordinary condition; and the Recife Collection of Brazil 6400 Reis, a focused set that is an almost complete date run of the denomination. "Our ANA World Coin auction is set to be one of the strongest we’ve ever had," said Tucker. "If bidders can’t make it in person in Boston, then we hope to see them on HA.com, on the telephone, or through our exclusive Internet bidding platform, Heritage LIVE!™." Lot 20007, Silver Rhegion Tetradrachm, c. 410-387 B.C., Choice XF: An outstanding tetradrachm from Bruttium, Rhegion, with front-facing lion’s head and right-facing head of Apollo, magnificently executed and preserved. Estimated at $30,000 to $35,000. Lot 20525, Chile Ferdinand VI Pillar 8 Reales 1755, AU55 NGC: One of the classic rarities of the entire Latin American series, variously described as Chile’s "Crown Jewel" or "Holy Grail." Estimated at $75,000 to $90,000. Lot 20605, Republic of China 1916 Commemorative Gold Dollar, MS64 NGC: A conditionally rare example of the already elusive Hung Hsien Dollar gold commemorative. Estimated at $27,500 to $32,500. Lot 21452, Japan Manen gold Oban, c. 1860-1862, XF: A late pre-industrial example of Japanese gold with handmade horizontal crenulations, authenticated by the Japan Numismatic Dealers Association’s Authentication Committee. Estimated at $27,500 to $32,500. Lot 21966, Venezuela Republic silver Essai Venezolano 1874, MS63 NGC: A supremely important Paris Mint pattern, sharply detailed and beautiful. Estimated at $60,000 to $75,000.